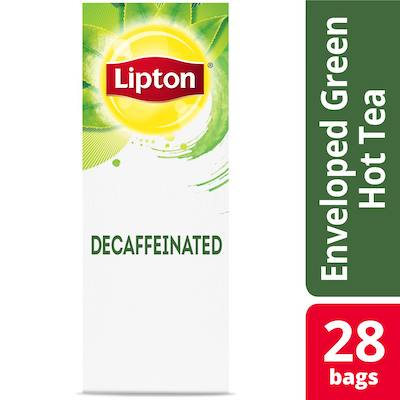 Bring a bit of balance to a hectic workday with Lipton Enveloped Decaffeinated Green Tea Hot Tea Bags. Made from fine green tea leaves sourced from 100% Rainforest Alliance Certified estates, Lipton Decaffeinated Green Tea offers a subtle taste and beautiful golden-yellow color that can be enjoyed any time of the day. These hot tea bags offer an ideal means of keeping employees satisfied and stimulating meaningful connections in the workplace. And thanks to their easy-to-steep design, they allow your colleagues to brew a cup of tea whenever they want. Lipton teas cater perfectly to your employees’ moods and preferences--even as they change throughout the day. Select from a broad offering of delicious office teas to help foster a happier and healthier work environment. For one cup: Bring fresh water to a boil and allow to cool for 30 seconds to 90 degrees Celsius (194 degrees Fahrenheit). Pour water over the teabag and brew for 1.5 to 2 minutes.